To call this one “disjointed” is putting it mildly; we got scenes from the past, present and future jumbled together in a jigsaw puzzle of an episode. Thank goodness it’s not something we have to deal with every week. Ever since Lost hit it big, plenty of serials have gotten the notion in their heads that they need to fit mandatory flashback sequences into every episode, even when they’re an unnecessary drag (hello, Arrow). The “future” (which gradually becomes the present) is Crazy Nick acting surprisingly competent for once, using the knowledge he gained from the previous episode to fearlessly cover himself in zombie glop and seek out Strand’s mysterious contact. The past is Strand’s — turns out that fortune he made was gained through less than ethical means, which we all should’ve expected. But the present? That’s when Alicia’s tomfoolery hits the fan* and the guys she contacted catch up with the Abigail, taking everyone hostage. *I should note that, since I’ve fallen behind on these recaps, we already know who actually tipped these guys off to the yacht’s location. That’s why today you’re getting two recaps at once. 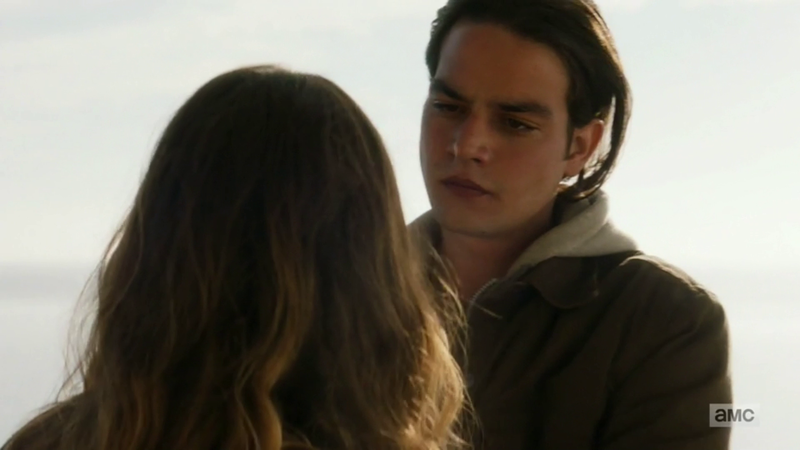 Chris and Ofelia are standing around the deck of Abigail when, for the umpteenth time, a bunch of people approach them asking for help. 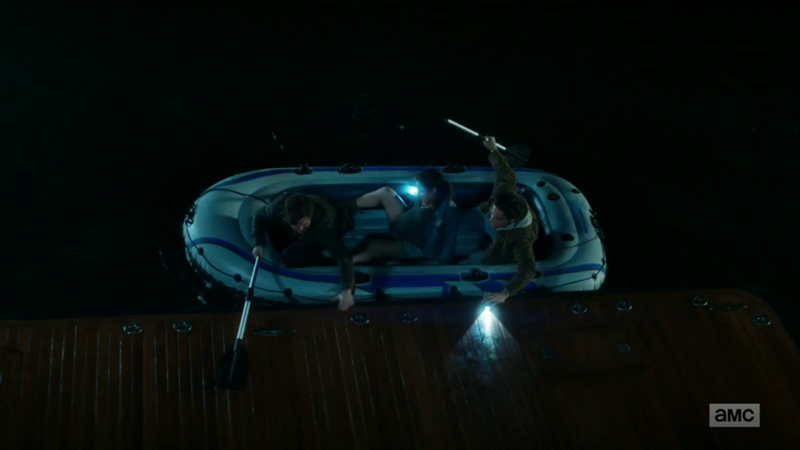 It’s two guys and a pregnant woman coming up on a small boat, and since all the adults are off who-knows-where, they get onto the ship easily while Chris and Ofelia stand there with open fish-mouths. As one might expect, it’s an act. These guys are pirates, and they want to make the ship their Jolly Roger. Where’s the heartless guy who boots everyone off the ship when you REALLY need him? He picked THIS confrontation to flee on a life raft. The pirates fire at Strand, and while he does get away, they manage to puncture the raft. I wonder how many life rafts the Abigail has — it has lost two now. Strand floats around on his raft, loses his portable communicator and gets sick….and I can’t say I felt that sorry for him. I was really hoping he would run into Alex and get what he REALLY deserved, but it didn’t happen. While this is going on, his life flashes before his eyes…he was once a con artist, and at some point he unknowingly tried to con ANOTHER con artist, but instead of seeking vengeance, the victim sought a relationship. This person was THE Abigail, whom we all assumed was a lost girlfriend or wife, but holy reverse-Metroid, he was unmasked to be a dude! The writers actually didn’t know this either at first. This is why they were stuck with the name “Abigail,” which they fixed by making his full name “Thomas Abigail.” It’s left an open question whether Thomas is still alive or not. I would bet he shows up somewhere in Mexico. Alicia recognizes the voice of Pirate #3 as Jack, whom she had that radio conversation with. “Uh-oh,” she thinks, slowly backing away. “Wait a minute, he’s hot! Never mind!” She starts backing toward him. 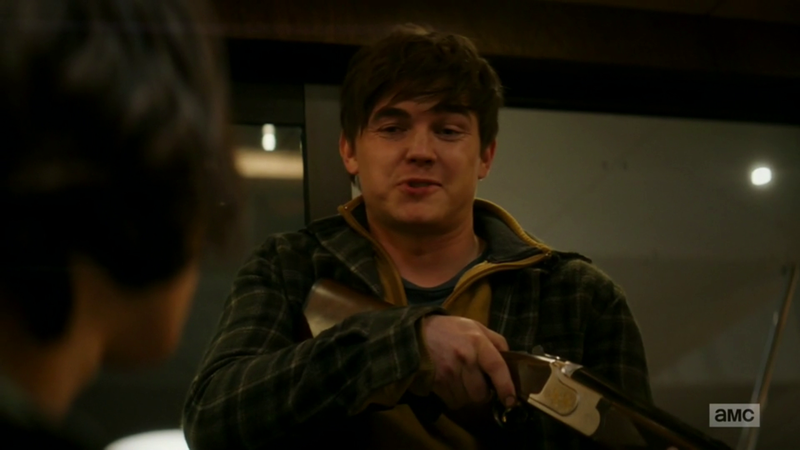 Ironically one of these guest stars was an actual teen heartthrob at one point — Jesse McCartney is playing the creepy Reed, and he’s barely recognizable in his greasy 5 o’clock shadow and double chin (I don’t think one of those things was makeup). Alicia has no interest in him, not that she gets the chance. Reed spends most of his time with Travis, demanding that he somehow get the Abigail’s motor running. That’s going to be a problem since Strand had the keys. Reed simply won’t take no for an answer and believes Travis is bluffing. 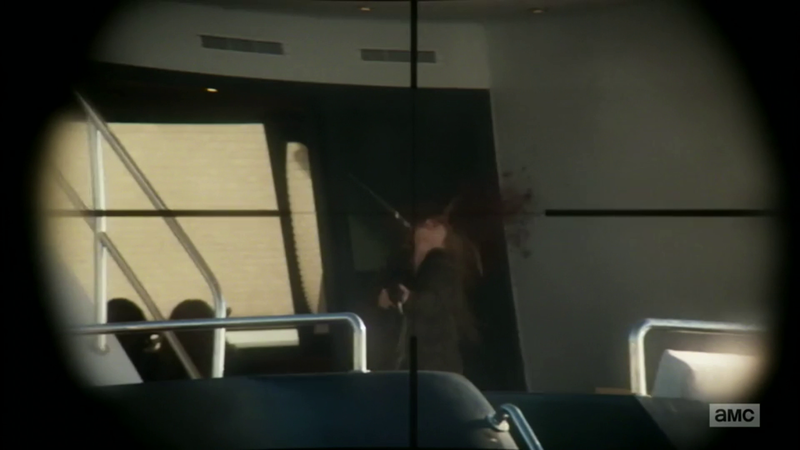 He holds a gun to Chris’s head and counts to five, shouting that he’ll blow Chris away at 5 if another person doesn’t step forward to start the boat NOW. Travis stands up and stammers that it might be possible to hotwire the Abigail, though he’s not sure exactly how. Reed leads him away to perform the task under his watch. Where did Jack come from, anyway? He tells Alicia some of the stories he told her over the radio were true. When his brother died, Connor (the pirates’ leader) saved his life and adopted into his gang, so Jack feels he owes him everything, even if he doesn’t always agree with what he’s ordered to do. Fair enough, but is Alicia stupid enough to fall for Jack under circumstances like this? According to Debnam-Carey on Talking Dead, she played these two episodes intending the performance to come off as vague. 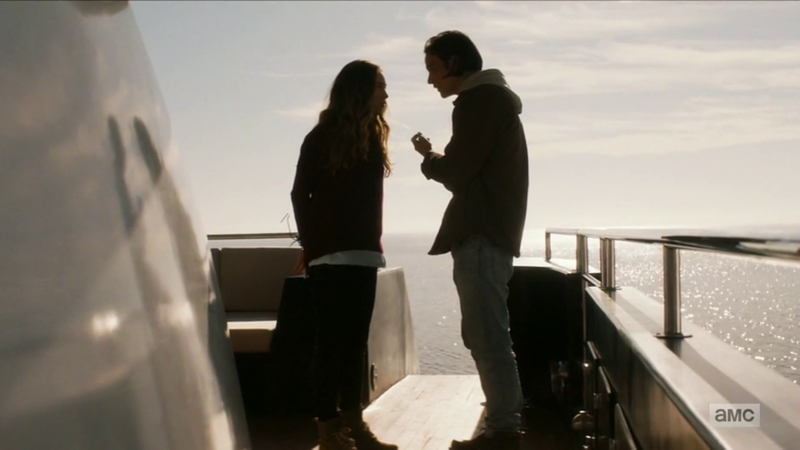 In this scene, where Alicia convinces Jack to trust her enough for him to loosen the ropes binding her wrists, it appears that she’s manipulating him. But in some scenes afterward she appears to be thinking “Screw safety, I’m in LOVE!” Jury’s out. I realize Jack is the only guy her age within a hundred miles that she’s not related to, but for the love of Pete, Aleece, please don’t be this needy. Back to the Adventures Of Crazy Nick, which aren’t quite as crazy this week. He does what he set out to do. He finds Strand’s contact, Luis Florez. 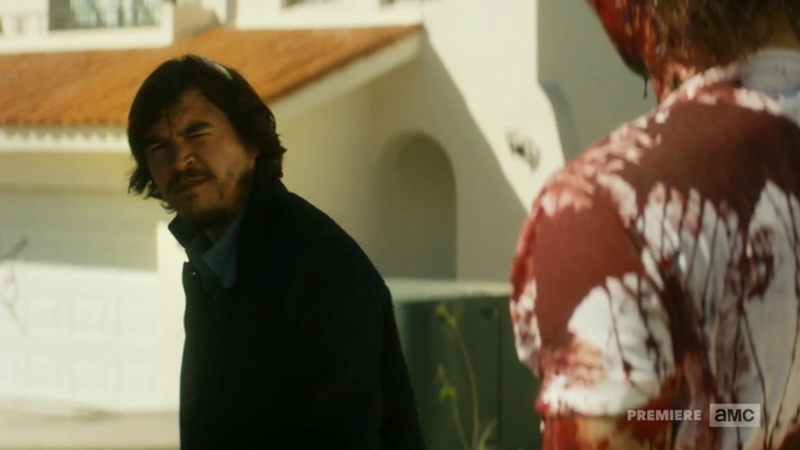 The original plan was for Strand and Luis to sneak across the Mexican border, but Nick informs Luis just how much of that plan has changed. What’s still unclear is why Strand needs some elaborate plan (and Luis) to get into Mexico when we can presume it’s as broken down as the rest of civilization. ….OR IS IT? They don’t know where to go next, but a few minutes of brutal torture with Reed should give them some information. And that brings us to Recap #2….